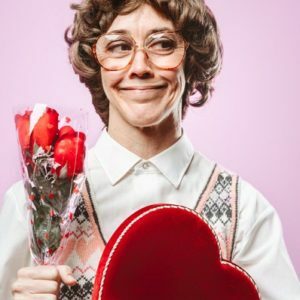 Hulu® began creating its own original series back in 2011 and original series on other streaming providers such as Netflix® and Amazon® have since become the norm. 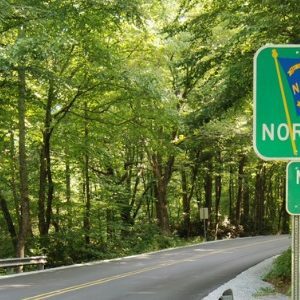 With Hulu’s hit series The Handmaid’s Tale premiering its third season in May, the team at CenturyLinkQuote.com decided to dig into the data and uncover each state’s most popular Hulu Series. Take a look at what the team found out below. The data team at CenturyLinkQuote.com conducted a comprehensive analysis to determine the Top 16 Hulu Series based on popularity rankings from sources such as IMDB. 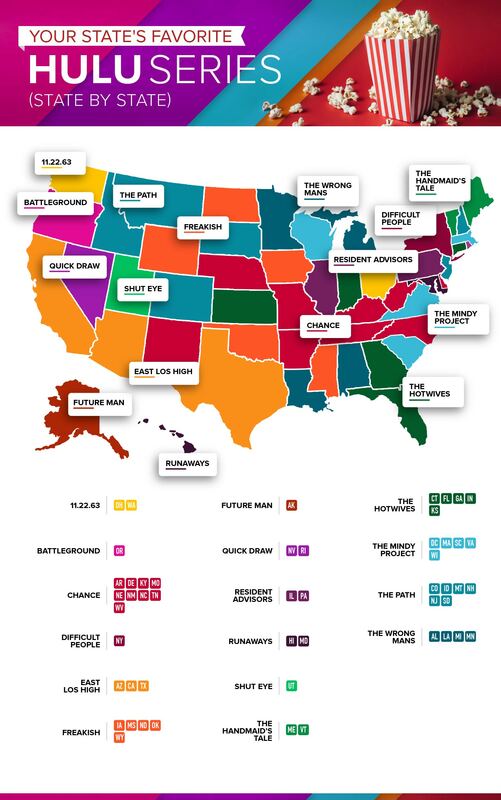 These 16 Hulu Series were then input into Google Trends to evaluate each state’s relative search interest, allowing the data team to determine each state’s most popular Hulu Series. Though it ran for only two seasons, Chance is the most popular Hulu Original series. Billed as a modern-day noir, Chance stars Hugh Laurie as Dr. Eldon Chance, a forensic neuropsychiatrist stuck in a rut who falls for a patient, Jaclyn Blackstone, who is potentially suffering from multiple personality disorder. Jaclyn’s ex-husband is a well-connected cop, and Dr. Chance soon finds himself in over his head, personally and professionally. From the executive producer of Friday Night Lights, and starring Aaron Paul, Michelle Monaghan, and Hugh Dancy, The Path follows the members of a fictional cult called Meyerism as they struggle with relationships, crises of faith, and ambition. 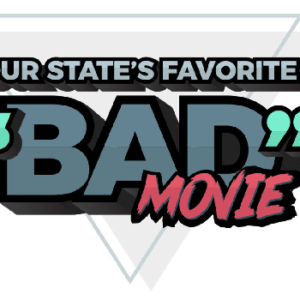 It makes sense that states with big cities would like this show the most. This New York City–based comedy follows the romantic misadventures of Dr. Mindy Lahiri (portrayed by actress Mindy Kaling) and her colleagues. If you like a show with a female lead who exudes confidence despite her many hilarious flaws, you’ll love Mindy. This series gained a following after running for three years on Fox. After its cancellation, Hulu “rescued” The Mindy Project, giving it three more seasons. The show’s final season ended on November 14, 2017. For many, Saturday detention brings to mind The Breakfast Club. For a new generation, Saturday detention is Freakish and surviving zombie-like creatures after a chemical plant near the high school explodes. The students, now trapped in the high school, must find ways to survive as supplies dwindle. Riffing off the popularity of The Real Housewives franchise, The Hotwives is a scripted TV show about the fictional, glamorous lives of “hot housewives” in different cities. Two seasons in, the show has moved from Orlando to Las Vegas. One thing is clear: whatever the city, there is sure to be drama. Inspired by the movie Burn After Reading and TV shows like Lost and 24, the two-part series The Wrong Mans stars James Corden (yes, James Cordon from Carpool Karaoke!) and Mathew Baynton as Sam and Phil, who work for Berkshire County. Sam answers a phone call at the site of a car accident, and, along with Phil, becomes entangled in a conspiracy. Hilarity and hijinks ensue. My So-Called Life. Dawson’s Creek. Gossip Girl. Glee. TV shows about high school life always seem to be popular, and East Los High is no exception. Five-time Emmy nominated Hulu Original East Los High has made its mark. Running for four seasons, the show follows a group of Latino teenagers as they navigate life in high school, and East Los Angeles. The creative duo of Josh Schwartz and Stephanie Savage, who were behind such hits as The O.C. and Gossip Girl, team up once again, only this time they set their sights on the Marvel Universe. Runaways, which is based on the comic books of the same name, focuses on six teenagers who discover their respective parents are part of a super villain team known as The Pride. The teenagers band together, and in the process learn of their powers. College is a formative time for many, presenting new opportunities, new experiences, and a taste of freedom. Dorms are a staple of college, as are the resident advisors (RAs) who oversee dorm life. Enter Resident Advisors, a comedy about the lives of the RAs in Hutcherson Dorm at the fictional Thoreau College. This dystopian drama took television by storm with its April 2017 release. The Handmaid’s Tale, based on Margaret Atwood’s novel of the same name, focuses on a handmaid living in a religious cult society where men rule and women are forced to serve and bear children to increase a steadily declining population. The twisted storyline presents a raw, riveting, and grotesque social commentary. The Handmaid’s Tale won eight Primetime Emmy® Awards (with thirteen nominations total) just a month after its debut, including best outstanding drama series, best actress for Elizabeth Moss, and outstanding cinematography for a single-camera drama. Set in Great Bend, Kansas in 1875, Quick Draw is a comedy that centers on Sheriff Henry Hoyle. A Harvard graduate, he arrives in Great Bend after the five previous sheriffs are murdered. Armed with knowledge of forensic science and a six-shooter, Hoyle sets out to clean up the town. 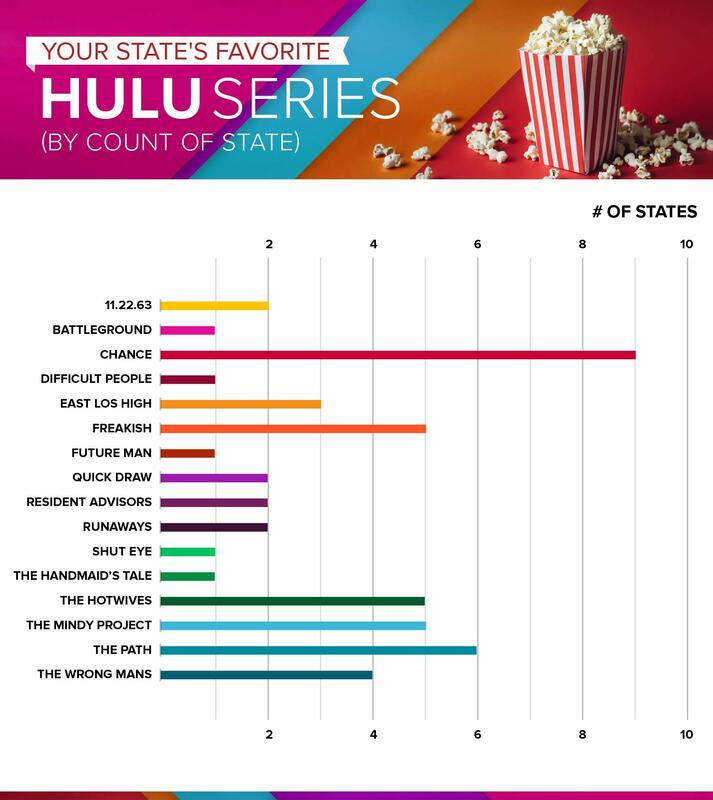 Oregon was the only state that watched Battleground more than any other Hulu series, while New York was the only state that watched Difficult People the most. That New York prefers Difficult People seems fitting considering the show’s heavy New York City influence. Utah was the only state that watched Shut Eye more than any other Hulu Original. Which Hulu series is your favorite to binge watch? 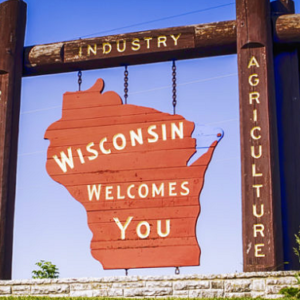 Does it line up with your state? Share this piece–and your thoughts–on social media with your friends and family.